Around this time of year, when I want to focus on thankfulness and giving, I find myself harboring feelings of resentment. “What about me? !” I want to scream on some days and sob on others. I am not an overly selfish person. I have my selfish moments (sometimes, days), but in general I tend to put others before myself. So what is it, I can’t help wondering, that makes these seasons—seasons designated for giving thanks and giving gifts—so difficult for me to conform to? As I’ve been reflecting on this question, I’ve realized that as I give throughout the year, I tend to overgive. I often know what I am able to give that will stretch me without putting a strain on me and my family. I will have determined the budget or time or energy I have available to expend. If I am not organized enough in the moment to have it already figured out on paper, I instinctively know when I have gone over the line in my giving because a sour warning takes root in my stomach. I am tired of my whining. I have started to pick at my logic and have torn away an old scab that covered a lie I long ago learned and embraced. The lie is this: if I give enough, I will be loved enough. Ah, again I find this hidden lie rooted within me. How many times does my Lord have to teach me the meaning of grace before I let His truth be learned and embraced? His truth is this: I can never give enough. And, this other truth of His rests beside it, even more difficult to swallow: I am already loved enough. Those two truths don’t rest beside each other easily within me. I want to earn love, I realize upon reflection. I want to know I deserve it. It is the way I was taught and it is the way that allows me to be in control. It is the way that means I should be loved; afterall, I have done the work to deserve it. But that is not the truth of our God. In relationship with Him, there is no earning. There is no deserving. There is only His love, freely given. To take it in, I must do the thing more difficult than working my fingers to the point of chapped cracking, my mind to the point of exhausted numbness, my wallet to the point of continuous debt. I must stop. Stop trying; stop working; stop earning. I must accept the gift. Accept it with the open hands and open heart of a child who has nothing to offer in return. That is another truth difficult to swallow: I have nothing to offer in return. Nothing He needs. And so I must lay aside my pride, that pride which is protecting the fragile and tiny piece of confidence in me. And what comes then, when all is laid bare? From my God, what comes is love. And what comes from others around me? I see now that it needs to not matter nearly as much as I let it. The others are like me, imperfect, fragile, broken. We cannot fill each other up. 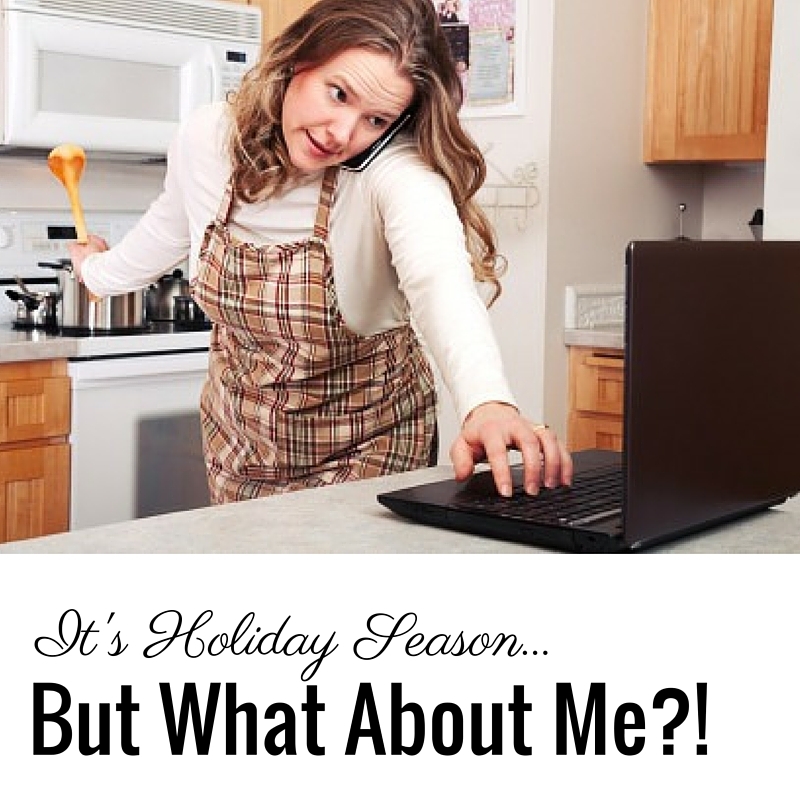 This holiday season, I need to change my cry from “What about me? !” to “What about me is it, Lord?” What is it You see that You love so much? I need to be transparent enough with Him to tell Him what He already knows: I need some extra TLC this season. And I need to let Him give it to me. Chris, I appreciate your blog this week and I identify with it. The Thanksgiving & Christmas holidays are really hard for me. I try very hard to give to others and then feel really sad when I feel that others don’t return the care back to me. I need to be reminded of why we are giving and of all the blessings I have for which to be thankful. The hardest part for me is to lower my expectations so that I am not disappointed. Thank you for your honesty! Karen, thank you for your comments. It can be a tough season. I think we all set expectations on others that lead to our disappointment. Maybe we should put our expectations only on God–He has made us lots of promises and He’s the only one capable of keeping them. I am praying for you and your sweet daughter to have many blessed days this season!